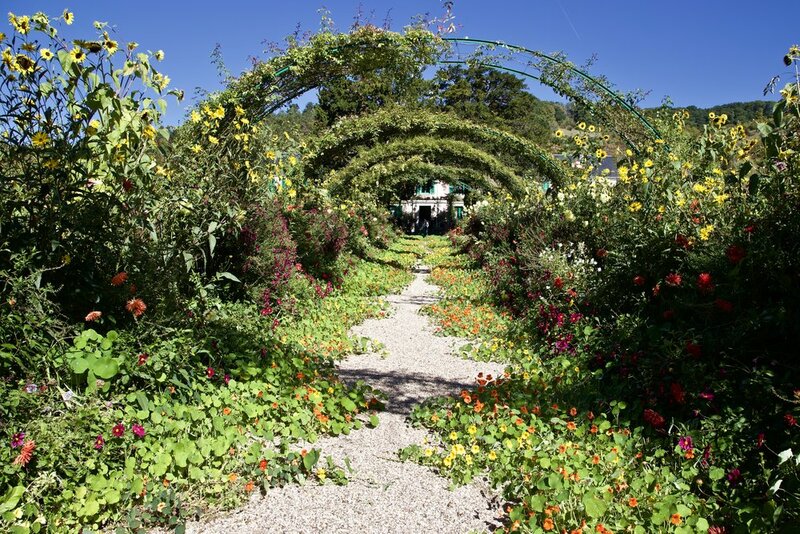 I’ve always enjoyed art and I have a soft spot for the Impressionists, so I was really looking forward to a visit to Monet’s home in Giverny. I was familiar with a lot of his work and had seen photos of his home and the grounds, so I felt prepared for the visit…but I wasn’t. First, there were a lot more visitors there than I expected and they came from all over the world. The nice weather had them filling up the narrow pathways through the garden and almost every good view was blocked by groups of self-absorbed young ladies taking selfies. Patience prevailed and I was able to get enough good images to provide a flavor for this wonderful place. It’s also much larger than I expected and crammed with all different types of flowers that create an explosion of color. I don’t know how the gardeners select what varieties of plants to place next to each other, but their process is masterful. It was the last week of September and the place was as lush as a jungle. You almost felt the need to keep moving in order to avoid being caught by the tendrils of some rapidly growing plant. A truly gorgeous place and worth the effort of dealing with the hordes of tourists. Next time, I’ll get there before they do.